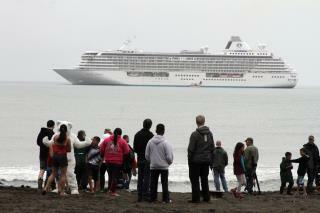 (Newser) – The Crystal Serenity's current journey through the Arctic is historic. At nearly three football fields long and 13 stories tall, the cruise ship is the largest ever to traverse the Northwest Passage, where its 900 or so well-heeled guests have glimpsed polar bears, kayaked along Canada's north shore, landed on pristine beaches, and hiked where few have stepped, the AP reports. The monthlong cruise began in Alaska on Aug. 16 and some remote villages along the way are seeing dollar signs, while environmentalists are seeing doom. The terrible irony with the Crystal Serenity's voyage is that it's taking place only because of climate change and the melting Arctic, says Michael Byers, a professor in the political science department at the University of British Columbia in Vancouver. Oh boo hoo. Environmentalists are being so simplistic about this entire thing. Quite frankly the 10th planet's 3,600 year orbit is what is responsible for a lot of this. But the govt sure as hell doesn't want anyone to know about that simply because the govt KNOWS they themselves cannot stop it. They know that when the planet gets close enough to Earth, the gravitational pull of the planet is going to cause major catastrophes that almost identically reflect many of the events described in Revelation. The govt knows that the apocalypse is upon us and that they can’t stop it. If they told people this then all hell would break loose and society would collapse just on that information alone. The thing is, the third world war will occur before this planet reaches its apex point to the Earth. First the world war, then the earthquakes. Sarah Hoffman saw it. Kind of ironic story, this. For many years I had always thought the so-called Northwest Passage was just a fictitious case of wishful thinking. Then I learned it was real. As I've stated before: I don't know anything about the "global warming" controversy, pro or con. What I do notice, obviously, is the results of human pollution. Sad. The navigator had a more important job than the captain! He had to keep the bearings straight!